When I’m putting an outfit together two of the most important accessories are my handbag and sunglasses. I never go anywhere without them and in my opinion you can never have enough of either ;) Today I’m teaming up with eBay Fashion, the world’s most vibrant marketplace for discovering great value and unique selections. I’ve never purchased a designer handbag from eBay until now and I’m so happy I did! I had a couple questions before finalizing my order and their customer service was super helpful, approachable and friendly. They made my experience so easy and fun! I’ll definitely be doing more shopping with eBay in the near future. Below I’ve listed more of my favorites or you can visit my eBay Landing Page here! Love ebay. :) And your shoes! Have fun at NYFW! Great casual outfit! Great accessories make big difference in an outfit! Beautiful casual look. Love your cute pink bag! Great combination! Love your style! 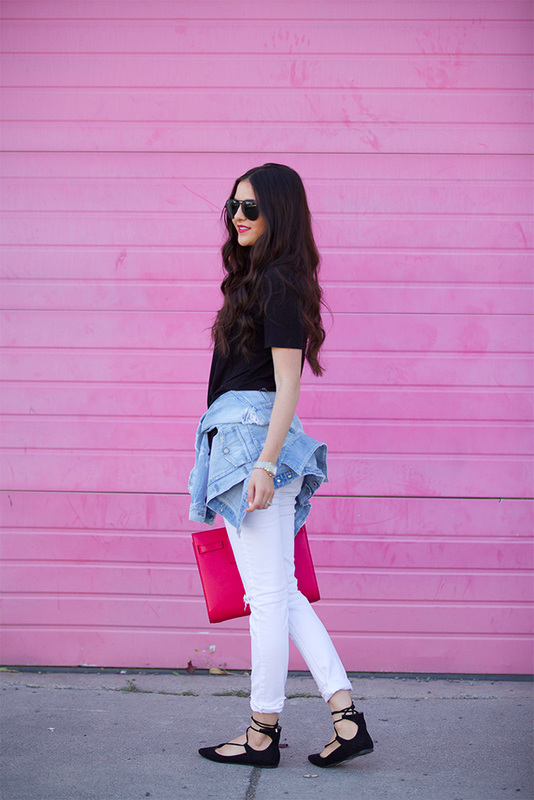 I adore the black and white paired with that vibrant pink! I LOVE the shoes, so cute! Love the sunglasses and shoes! Have a great day! I had no idea you could get designer handbags on Ebay! That bag is such a great find! Yep, I totally need this outfit!! Love this casual look, great outfit! Last year I got a Coach bag on ebay! eBay is a great go-to to buy and sell! Loving the pink wall! I couldn’t agree more! Sunnies and handbags all the way! Great choices. Great look. Love those lace-up flats! That is a gorgeous bag! I am always nervous about buying high end items from ebay. How do you know they are not fake until you get them? Great pictures! I love the outfit and that bag is gorgeous! http://trendkeeper.me.. Clouds, Cardigans & a giveaway! I’ve never purchased from eBay! I’ll have to give it a try. Accessories totally make the outfit in my opinion!! I’ve never used eBay for clothing or handbags either but they are my go-to source for perfumes and scents! I can usually find the best deals on pretty much any scent on eBay and it comes straight to your door! Your hair looks awesome! And I’m loving those shoes. You always have the cutest handbags! This one adds the perfect pop of color! super cute look! I never think about shopping on ebay…maybe I will now! So excited to watch you during fashion week! I’ll be living vicariously through you while I’m home with my little one. Love these jeans! I love ebay! I feel like I’ve always found the best deals on their website. Couldn’t agree with you more about the 2 most have accessories (purses and sunnies). Where are they from please? Definitely my style, love this! Especially those shoes! Ebay is so great because they have eevveerryytthhiinnggg. 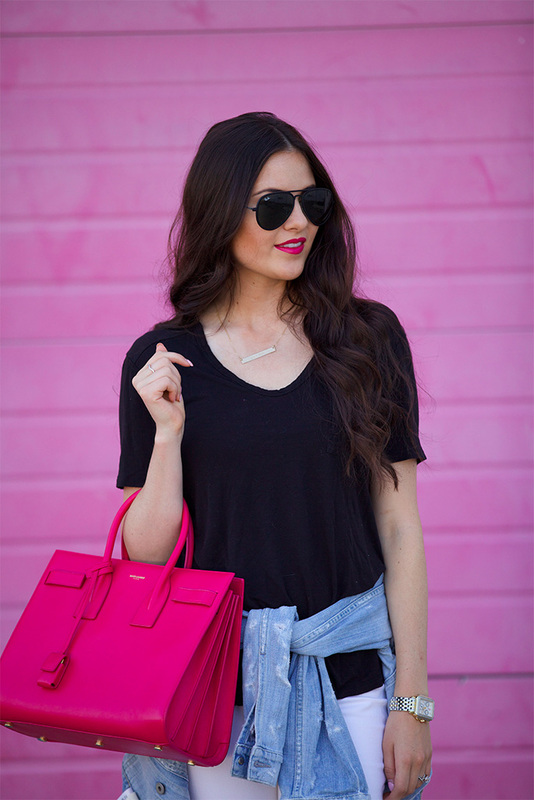 I love the pop of pink from your lipstick and bag! My only concern about ebay is how I should know that the product is authentic? Those shoes are amazing! Love the bag too how great its from ebay! Wow that is such an amazing bag, I have been wanting the black one for so long now but the pink is absolutely gorgeous !! Those shoes are adorable on you! And I love eBay! A great way to get designer goods for a lot less! Adorable look and the accessories are of course fab! Ebay is great for splurge items! I feel less guilty when I purchase higher ticket items on ebay. Cute casual outfit, and that bag is amazing! With so many great online stores, I often forget Ebay is still around! I will definitely check it out in the future! One of my favourite ways to style an outfit is to keep it simple, and adding a pop of color or pattern somewhere! Love the denim on denim. I am a big ebay shopper too! Love the denim wrapped around the waist. Adds such a nice touch to your look. the color of that bag is so fun! Your bag is gorgeoussss! I’m loving the color of it. So glam! Love that bag! Lovely simple and comfy outfit. Love your lace up flats! Amazing bag – love it! Beautiful casual look! I agree about never having enough handbags!! This is definitely a great way to start building up my sunglass collection! 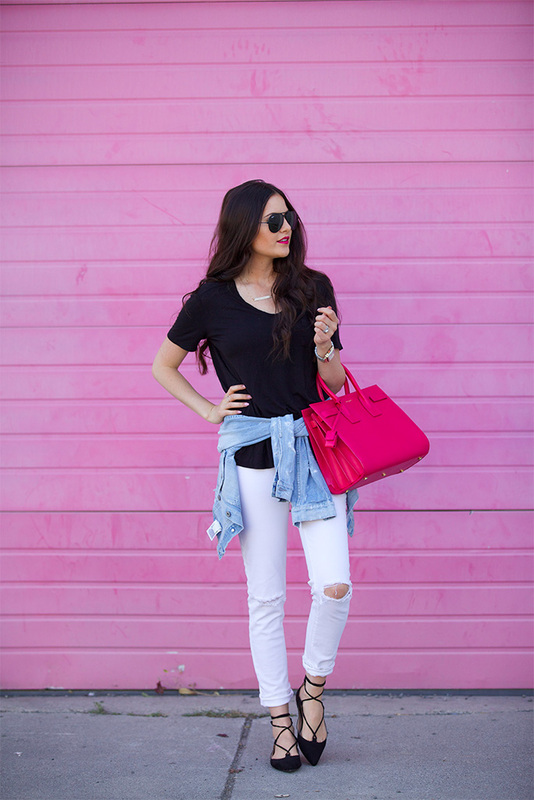 That pink backdrop is so fun and I love your bag! Love this look! Accessories really can make of break an outfit! Love it! I love how you add that POP! to your outfits with a pink or red accessory :) Gorgeous outfit! Cool and easy outfit! Love it. You look so chic and stylish. I adore this combo and you did a fantastic job styling. I especially love your flats! You look gorgeous. I love the bag!! 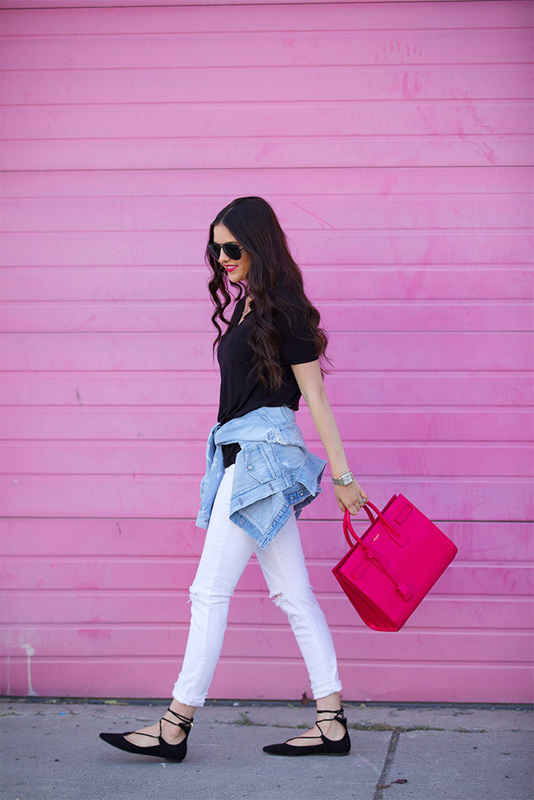 I LOVE that bright pink bag! Great outfit! I am a huge fan of this outfit! I love how simply it is that someone could wear it everyday.